​Get an Annual Membership for 20% off!! Enjoy all the benefits of Membership!! Enjoy a 15% discount on all regularly priced merchandise. Receive advanced notice and a 5% discount on workshops. A regular membership supports our studio and the vision of providing healing practices to those who cannot afford them. Join and support your friends and neighbors. Monthly auto-pay on a credit card required. Must be purchased at the studio. Stop in soon. ​Buy classes here and sign up for your classes under the Class Schedule and Sign In tab. ​Our "virtual" system will keep track of your purchases and your visits. Drop-in Pass: $15 A Walk-in Pass is good for one class on the day of purchase. 10 Class Pass: $125 Each class is only $12.50 with this pass. Good for any weekly class. Workshops and events not included. Valid for 180 days. 20 Class Pass: $200 Each class is only $10 with this pass. Good for any weekly class. Workshops and events not included. Valid for 180 days. A great way to try yoga. Start fresh. 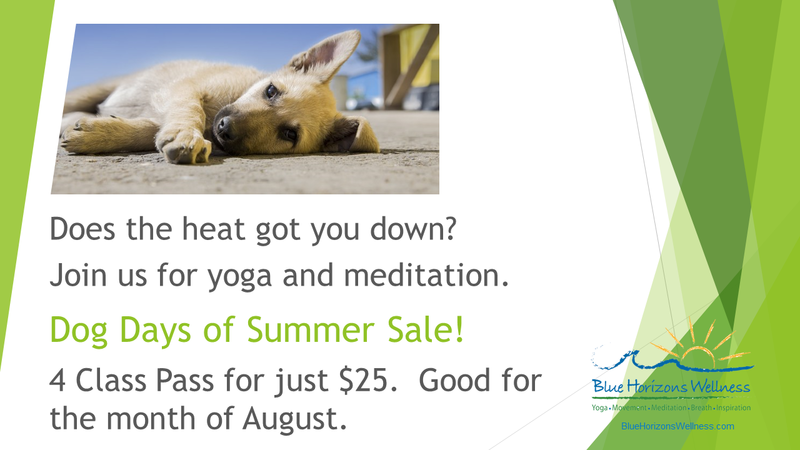 Begin a positive new way to be with yoga and meditation for $21. Good for any Weekly Class for 21 consecutive days!!! Come as often as you like! (Here's the small print - expires 21 days from your first class, cannot be purchased if other specials have been purchased, for local residents only). ​Enjoy saving money when you take two or more classes per week.​ Enjoy a 15% discount on all regularly priced merchandise. Receive advanced notice and a 5% discount on workshops. A regular membership supports our studio and the vision of providing healing practices to those who cannot afford them. Join and support your friends and neighbors. Monthly auto-pay on a credit card required. Unlimited Classes: $89 / month. No contract required. Visit as often as you like for one month. Looking for the perfect gift for that special person in your life? Blue Horizons Wellness gift certificates are perfect for friends and family of all ages - whether they are new to yoga or have been practicing for years. Blue Horizons Wellness gift certificates can be created for any $ amount and your loved one can use it for any of our classes, class passes, series classes, workshops or gift items from our Shop! A Gift Card is a great way to give someone you care about a gift that is healing and rejuvenating! We accept cash, check and credit cards. *Monthly Unlimited with Auto Pay renewal will automatically deduct monthly payments from a credit card account, three-month minimum and signed contract required. 30 day notice (in writing) must be provided to opt out and refunds will not be issued once account has been debited. Monthly Unlimited Passes can be purchased anytime during a month and will expire 30 days from attending first class. Prices and policies may change at any time. **Students, Military, Seniors (65 years or older) must buy in studio and present ID.